Companies which are previously focused on domestic markets are now entering into other countries due to greater opportunities in international markets. Technological development shrinks distances between International markets. Internet and online software perform the great role in this regard. 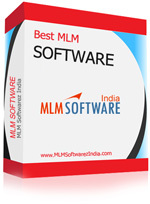 MLM Software India doing their efforts eaiser by providing Online or Web Based MLM Software to launch International Multi Level Marketing Company and manage their Direct Selling Business. Through our Online MLM Software you can approach to the customers of the globe. Our Web Based Direct Selling Software contains all the required modules to manage any MLM Business worldwide. Any multi level marketing company includes both officials and customers or MLM Networkers. MLM company officials can view customer&apos;s information, status of their work and manage all the activities from a central module of the MLM Software called Administration Panel. This online MLM Software can be controlled and managed from anywhere by seating in a room or remote area. Customers also can visit their status and check their earnings from customers Panel. They can pay online by using the payment gateways and join your online MLM Business. If you are willing to view an Online Demo of our Web Based Online MLM Software you can request a Demo of MLM Software.